The customers' satisfaction is our joy. 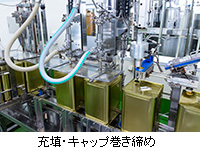 Kakusan Foods Co., Ltd. proposes ways to flavor various foods through our business of manufacturing liquid seasonings (extracts, soups, sauces, dipping sauces, etc.). Our objective is to manufacture products that satisfy our customers, especially products that are also healthy and tasty. We take the utmost care in the manufacturing process of our products, all the way to delivery to our customers. We are most delighted when our customers find pleasure and value in using our products. We also continue to make efforts in improving the quality of our products at reasonable prices through our daily operations, while complying with the basic principles of food manufacturing. To maintain our company's business success, we will continue to pursue our dreams by taking on new challenges in a cheerful and positive manner. 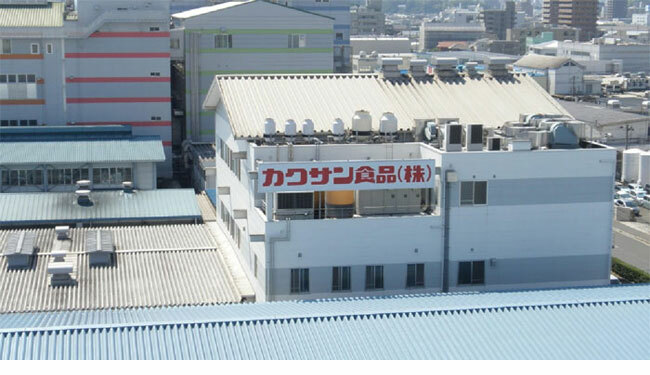 Kakusan Foods Co., Ltd. proposes ways to bring delightful tastes to your table through our business of manufacturing liquid seasonings (fish extracts, soups, sauces, dipping sauces, etc.). Liquid seasonings can be a great enhancement to your cooking. They bring out the flavor of ingredients and enhance taste. They are therefore indispensable items in your daily food life. 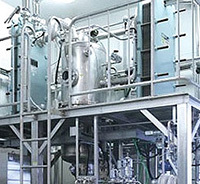 Using techniques of processing Oyster that we accumulated through many years of experience, we deliver extract products for health food use, featuring the useful components of Oyster. Oysters are called the "milk of the sea" for their ideal balanced nutritional value. Oyster extract, which is made by concentrating oyster juice that is produced by heating oysters with hot water, is rich in flavor and can be used to develop tasty products with the addition of only a small amount to a variety of ingredients. 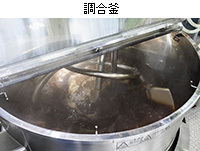 This product is made by concentrating oyster juice that has been extracted from shelled Japanese oysters by heating them with hot water for a long time. It has an elegant aroma. * Powder form of product available. This product is made by concentrating oyster juice that has been extracted from shelled Japanese oysters by heating them with hot water for a long time. 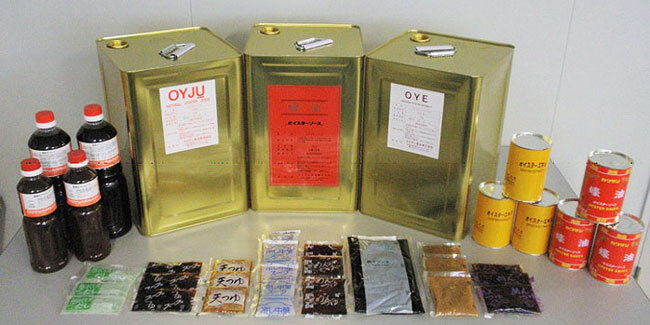 Compared with OYJU, this is more concentrated and roasted more strongly. This extract increases the flavor of thick seasonings with the addition of only a small amount. When oysters are steamed in the process of shelling them, oyster "drips" come out. 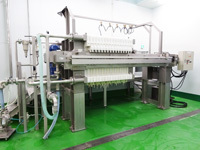 This product is made by concentrating the drips of oysters from South Korea for a long time. It has an odd taste but also a rich flavor, and so goes well with ingredients for Chinese cooking. The above are only some examples of our products. We have a variety of specifications available depending on your needs. We are also manufacture OEM/PB products on your request. 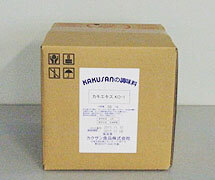 This product is made by adding sugar, starch, seasoning, etc., to fresh extract of Japanese oysters. By adding a small amount to your cooking, it will create mild, rich flavor that is unique to Chinese cooking. This product is suitable for cooking using soy sauce, such as meat-and-vegetable stir fries, and braised tofu. 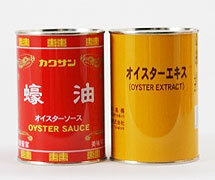 Please try Kakusan Food's oyster sauce with its rich oyster extract. This oyster sauce has a rich flavor. Can type 4 is also available. This oyster sauce has a rich oyster flavor and is reasonably priced. The above are only some examples of our products. We have a variety of specifications available depending on your needs. We are also manufacture OEM/PB products upon your request. This is made from scallop juice that is extracted from scallop adductor muscles from Hokkaido by concentrating them at low temperature. 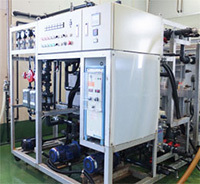 This product is made by concentrating and extracting the juice of mussels from Europe, and adjusted the salinity. This product is made from kelp from Hokkaido by concentrating it at a low temperature so as not to lose its flavor. 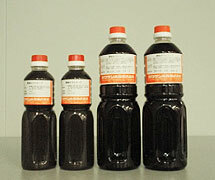 This product is made by desalinating and concentrating Thai Nam-Pla sauce, and reducing its unique strong aroma. This product is made from the heads of shrimp, and has a unique, thick shrimp aroma. It is rich in succinic acid and umami flavor that are unique to clams. The above are only some examples of our products. We have a variety of specifications available depending on your needs. Please contact us for extracts of other fish that may not be introduced on the website. This product is rich in glycogen, zinc and taurine, all of which are healthy nutrients contained in oysters. 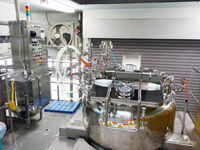 The amounts of these components contained in this product are ensured by calculation. This is an oyster extract for healthy food. This product is rich in glycogen, zinc and taurine, all of which are healthy nutrients contained in oysters. This is an oyster extract for healthy food. 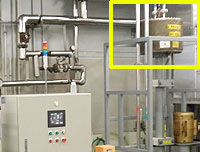 The assured contained amounts are lower than those in the OYP-5 product. This product is made by grinding oysters and letting them undergo enzyme degradation. This product features zinc found in oysters, containing a high level of the mineral. 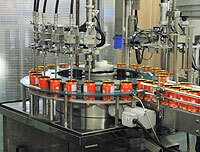 We manufacture RHP/SE products for soups and sauces to meet your needs. Product configuration: various configurations are available according to customer needs, ranging from 5 g to 600 g, including OEM/PB products. 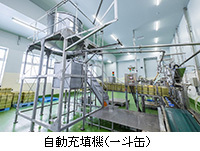 Kakusan Food Co., Ltd. works at accumulating manufacturing techniques and know-how at all times to meet the needs of all customers. 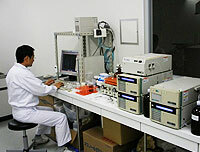 We actively invest in our facilities, aspiring to enhance product quality and production efficiency. We have a lineup of pots of various capacities, ranging from 150 L to 1500 L, to blend, heat and cool raw materials. We use different pots depending on the purpose and quantity of manufacturing. As for the clinoaxis kneader with its strong agitation power, we have one unit of 800 L and five units of 1500 L to manufacture products of uniform and stable quality. 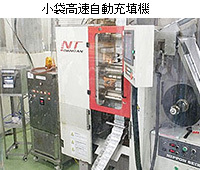 This machine fills a fixed amount of products into PET bottles and can type 4. 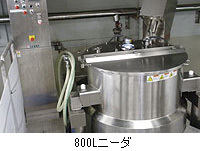 It fills precise amount of products at high temperature under a hygienic condition. 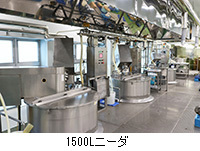 The machine can fill PET containers of 500 ml, 1.0 L, and 1.8 L, as well as can type 4. 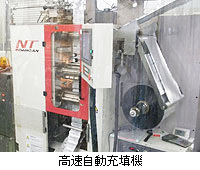 The machine is able to fill the precise amount at high temperature. After the filling, it can also tighten the cap automatically. 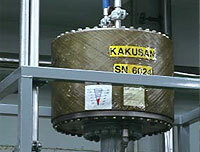 Products that have been filled at high temperature need to be cooled down quickly. This machine cools down 18 L cans after filling them at over 90°C to below 40°C within five minutes to maintain the product quality. 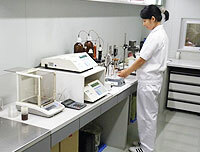 Analyze the salt content by computer, and desalinate the fish extracts, etc. to the targeted salinity. 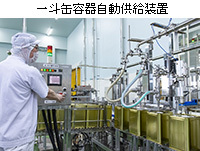 Maintain the quality of products by quickly pasteurizing heat-tolerant bacteria, such as spore forming bacteria, at 120°C and by cooling. Separate high and low molecular components using a membrane. 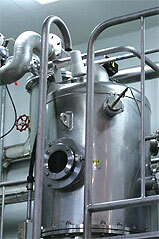 We concentrate extracts in a low-temperature, low-pressure environment. 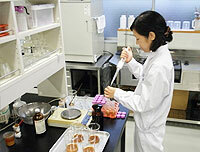 We can also concentrate foamable extracts effectively to maintain the quality of their flavor. 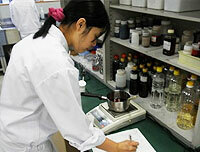 We manufacture extract powder mainly for fish extracts. 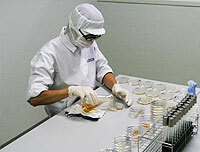 We can accommodate production ranging from small quantities of samples to high-mix low-volume production. 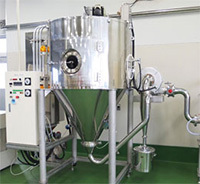 Using six high-speed filling machines, we can fill a wide variety of sizes, ranging from 5 g to 600 g.
We can maintain the hygiene of the products as the filling is conducting at the clean booth. 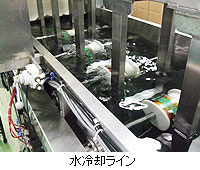 Products are water-cooled right after the filling. We also provide OEM manufacturing. 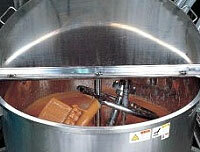 Our liquid seasoning products (fish extracts, soups, sauces, dipping sauces, etc.) have a high reputation for their taste, and we receive customer requests to develop various kinds of products for business use. Our Sales and Marketing team and our Development team work together to develop sample products and give presentations on our products. Please feel free to contact us for any inquiries. All our Sales & Marketing members have experience at the actual site of manufacturing and are familiar with the manufacturing techniques involved. We also respond to customers' request promptly. 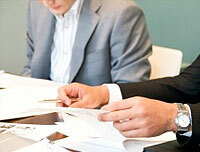 We thoroughly discuss customers' needs and their issues to resolve them. 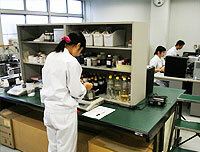 We improve our products until we satisfy customers' requirements. We conduct small lot test at times. 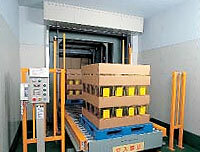 We manufacture and deliver products to our customers as quickly as possible. Work in the Development Department is divided into two main tasks: the development of new products and the quality management of the products we manufacture. Since the company was founded, we have been focusing on building up our know-how of product development, as the development of new products has a major impact on our business strategies and determines the future of our company. we have been developing extracts by using unused fishery resources, and liquid seasonings by using analytical data of amino acids. 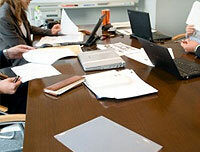 Another essential task in the Development Department is quality management. Products are manufactured every day in the Manufacturing Department under strict process checks in compliance with the ISO9001 quality manuals. The Development Department integrates the final phase of checks, determines the criteria for quality management at the manufacturing line from the physicochemical and microbiological perspectives, and carries out lot inspections of all products we manufacture. We also have the authority to judge the shipment of each product based on the inspection results and management information on manufacturing processes. We also carry out time gradation tests and set appropriate expiry dates, assuming every possible condition that the products may be preserved under.